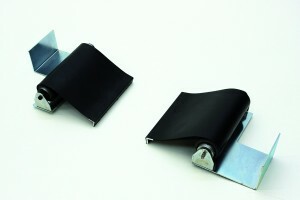 Available in a range of widths and travel lengths, these roller covers are designed to prevent entanglement of the operators clothing in the rotating Feedshaft and Leadscrew. They are supplied as a pair, one for each side of the saddle, one side rolls up, the other extends as the saddle travels. The roll out cover is manufactured from nylon mesh reinforced neoprene designed to be resistant to hot swarf (turning chips). Because all machines are different, no mounting brackets are supplied so design and manufacture of simple mounting brackets is the responsibility of the purchaser.